Our fertilisers are sourced from the largest and most reputable manufacturers of quality fertilisers in the world. When material arrives at our premises in New Ross, we carefully sample, test, screen and blend our products to ensure they are dust and lump free and of the best possible quality before going out on farm. Renowned as ‘Easy to do business with‘, NitroFert experts are always ready to advise and help with any queries you may have. All NitroFert products will spread accurately over a range of widths & our fertilisers are stringently tested to meet strict quality criteria in terms of size, shape, density and strength of particles. Our products have been independently tested for spreadability by SCS ltd in England where they performed excellently, achieving perfect spread patterns! The soil is the foundation of any successful farm system and with the correct choice of fertiliser and technical expertise, NitroFert can help farmers achieve a profitable and sustainable farm system. Micheál Crowe, Cappawhite, Co. Tipperary. Finalist in NDC & Kerrygold Quality Milk Awards 2014. 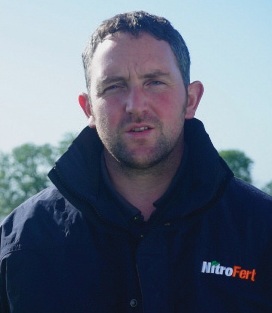 “Since changing to NitroFert fertilisers over 3 years ago, I have seen a big improvement in the quality of the sward – my cows are happier and more content due to the palatability of the grass and my indexes are showing a rise in soil fertility.